Sperone Westwater is pleased to present William Wegman: Postcard Paintings, a solo exhibition of recent paintings by the celebrated American artist. The exhibition coincides with the publication of William Wegman: Paintings (Abrams, 2016), a new monograph featuring essays by Bob Elliott, Martin Filler, Amy Hempel, Robert Krulwich, and Susan Orlean. This is Wegman’s sixth solo show with the gallery. Wegman mounts postcards onto wooden panels, embellishing their subject matter and seamlessly linking them together. The found images merge to create complex spatial arrangements, fantastical landscapes where epochs and cultures collide. The artist’s hand is always evident and these paintings are marked by Wegman’s humor and improvisation. In Bridge in Question (2012), the artist turns the rigid geometry of San Francisco’s Golden Gate Bridge into playful, scrawling loops. 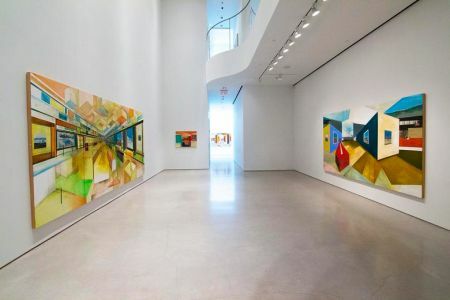 Lobby Abstract (2015) uses the "push and pull" of a Hoffman painting to radically rearrange the space of a 1960s hotel lobby while Mies and Corbusier on Vacation (2015) turns the linoleum floor of a Miami sunroom into a Vorticist architectural study. Inside Outside (2014) shows a seated figure disappearing into the environment outside the windows, his head bracketed away from his body by the white frame around the postcard image. In the large-scale Hopper Origami (2014) and The Great Indoors (2013), a panoramic space permits scrolling glimpses of seemingly contradictory scenes depicting Christmas trees jostling against beach scenes and domestic and museum spaces colliding. These works exhibit an unabashed sense of play and showcase the artist as collector, staging and populating his pictures with an enormous range of imagery and challenging himself to create a scaffolding for things that do not seem to go together. William Wegman was born in Holyoke, Massachusetts in 1943, and received a BFA from the Massachusetts College of Art, Boston and an MFA from the University of Illinois, Urbana-Champaign. His work has been exhibited extensively in both the United States and abroad, including solo exhibitions at the Walker Art Center, Minneapolis (1982); San Francisco Museum of Modern Art (1988); Whitney Museum of American Art (1992); Museum of Fine Arts, Boston (2001); and The Art Gallery of Ontario, Toronto (2002). The retrospective “William Wegman: Funney/Strange” held at the Brooklyn Museum traveled to the Smithsonian American Art Museum, Washington, D.C.; the Norton Museum of Art, Palm Beach; the Addison Gallery of American Art, Andover; and Wexner Center for the Arts, Columbus (2006-2007). The Bowdoin College Museum of Art presented “William Wegman: Hello Nature,” a major survey of over 100 nature-related works by the artist in various media (2012), which traveled to Artipelag, Värmdö, Stockholm, Sweden (2013). William Wegman, an exhibition of drawings and altered photographs from the 1970s and 1980s, and one new painting, will be on view at Magenta Plains, 94 Allen Street, from 17 March – 24 April.